Steve Round, Jimmy Lumsden and Chris Woods have been appointed as Manchester United’s assistant and first team coaches. 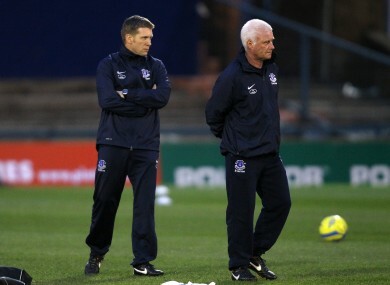 Steve Round and Jimmy Lumsden worked under Moyes at Everton. STEVE ROUND HAS been confirmed as Manchester United assistant manager on David Moyes’ first official day in charge at Old Trafford. The 42-year-old links up with the Scot after first working under him at previous club Everton. The Premier League champions have also announced Chris Woods has joined as goalkeeping coach, while Jimmy Lumsden takes up a coaching role at the club. “I have worked with Steve, Chris and Jimmy for a number of years and I am delighted they have decided to join me at this great club,” Moyes told the club’s official website. Lumsden reunites with Moyes for a third time, having also been a part of his backroom team at Preston and Everton. Woods is a former England international who was part of the 1986 and 1990 World Cup squads. He is a former Premier League goalkeeper having enjoyed a five-year spell at Sheffield Wednesday, and he also played for Scottish giants Rangers. United executive vice chairman Ed Woodward added: “I believe with David and his new team in place, along with our current backroom staff, we can now start preparing for the new season ahead. Email “First thing's first: Moyes brings in his new backroom team”. Feedback on “First thing's first: Moyes brings in his new backroom team”.